It is great to celebrate our regional differences in the UK, and nothing says Scottish more than their national icon Rabbie Burns. His life is celebrated on 25th January every year in Scotland and more notably via a ‘Burns Night’ celebration involving a feast with haggis! Don’t worry though, as there isn’t any haggis in these cupcakes, no, we celebrate Burns Day with a wee drop of whisky in our buttercream frosting. Well nothing says Scotland more than a wee drop of whisky we think! You don’t have to buy a big bottle of whisky (if you haven’t got one gathering dust in the cupboard) you can always buy a miniature from most off licenses. These cupcakes are extremely moist because we use one of our favourite chocolate cakes recipes. The recipe we use calls for vegetable oil and buttermilk which makes the cupcakes really lush to balance against the whiskey Nutella buttercream. Brown Muffin Size Cup Cake Cases. IT IS IMPORTANT THAT ALL INGREDIENTS ARE AT ROOM TEMPERATURE !!! Put the oven on to heat up to 160 degrees Celsius for fan oven. 180 degrees non fan. Whisk eggs, caster sugar and oil together for approximately one minute. Place the flour, cocoa powder, baking powder into a bowl and pour in about half of the egg sugar and oil mixture with half of the buttermilk. Whisk by hand for approximately one minute before adding the rest of the egg mixture and buttermilk. Whisk again by hand for 30 seconds. Fill the cupcake cases to just under halfway and place the cupcakes in the oven for approximately 16 mins. Test with a skewer to ensure they are cooked. Cool the cupcakes on a cooling rack until completely cool. Whisk the very soft butter and icing sugar together for the buttercream frosting. When light and fluffy add the Nutella and whisk again. Now add the whiskey and whisk once more. Place the frosting into a disposable icing bag and make sure it is filled to the tip. Cut the end off the piping bag about 1 cm from the end and pipe the frosting in a circular motion onto the top of the cupcakes. 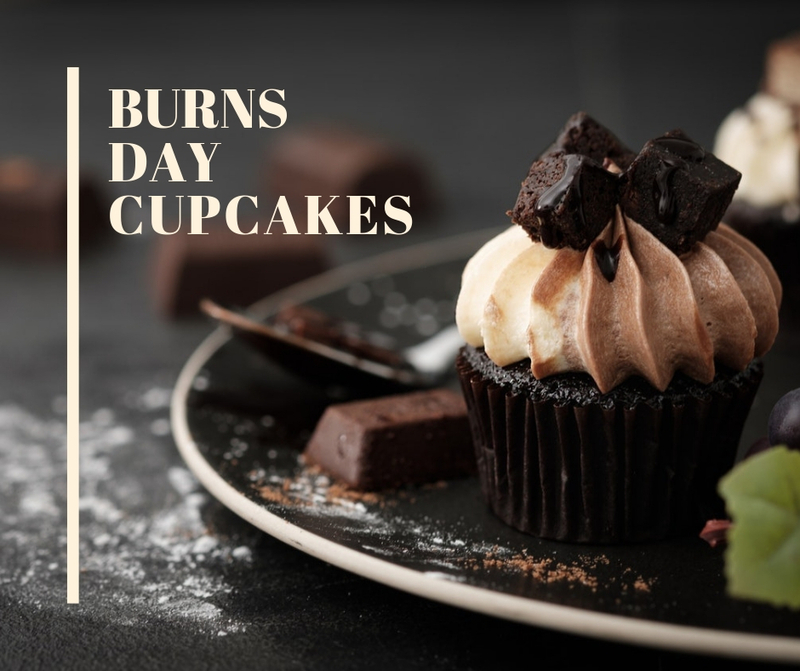 If you have a 1M or 2D nozzle you can use your talents learnt on our Cupcake Master Class to give a professional finish to your Burns Day Cupcakes. Finally, cut your chocolate brownie into small cubes and place on top of the cupcakes.